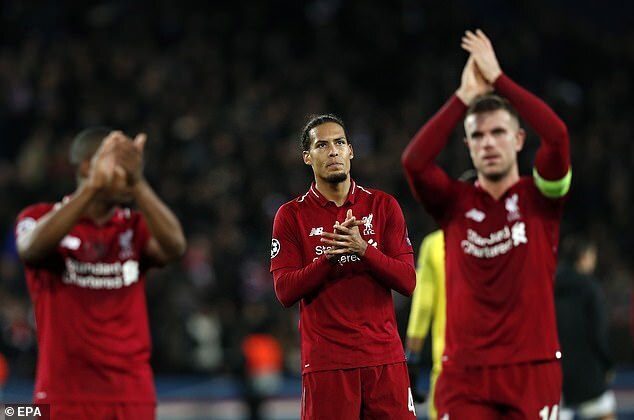 Defender Virgil van Dijk insists Liverpool have not become a bad team because of their three Champions League away defeats. The Holland defender believes the difficulty of their group facing Paris Saint-Germain, to whom they lost 2-1 in France on Wednesday, Napoli and Red Star Belgrade has almost been forgotten in the clamour to highlight their European woes on the road. Liverpool have lost three group matches for the first time, requiring them to beat Napoli 1-0 or by two clear goals in their final game to progress to the knockout stage. And while that is being portrayed as the club’s hopes dangling by a thread, Van Dijk has a different view. ‘We don’t need to forget that we played Napoli, one of the best teams in Europe; PSG, one of the favourites to win the Champions League; and obviously the game in Belgrade was not good enough,’ he said. ‘We don’t need to (think) we are a s*** team, basically. It can happen. But the frustrating thing is how we conceded the goals and then it’s always difficult to come back. ‘I don’t know if there’s any explanation for that right now because I can’t think of one, otherwise we should have used it already. 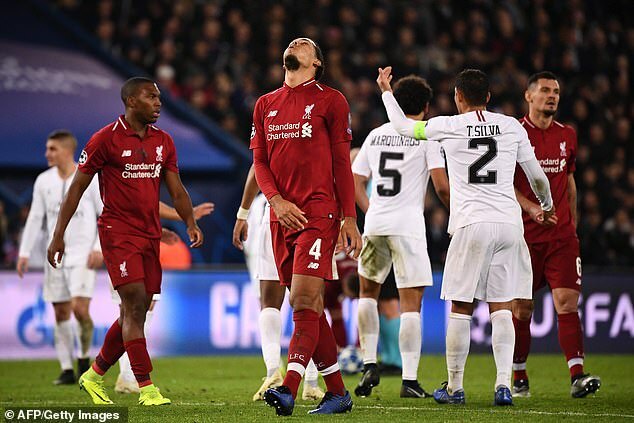 Van Dijk was critical of PSG’s world-class players unnecessarily resorting to theatrics and gamesmanship. 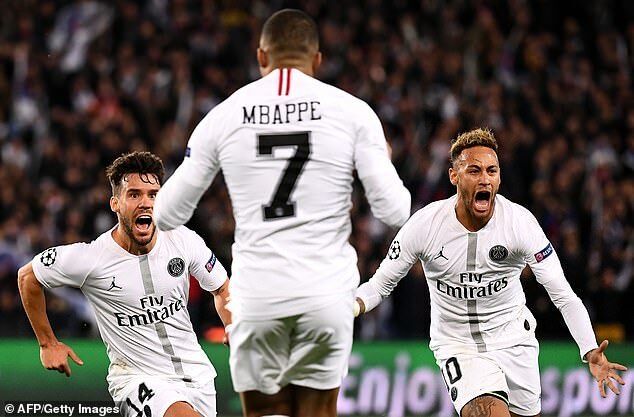 Neymar was the chief culprit in the Parc des Princes as while the Brazil international produced some classy moments, including starting and ending the counter-attack which resulted in PSG taking a 2-0 lead, he dedicated far more time to throwing himself to the ground and rolling around. ‘Obviously they’re world-class players but I don’t think it’s needed in the game at times,’ added the Dutchman. ‘Every time we made a foul they all came to the ref trying to get us a yellow card. We should do the same at times and I think in the second half we did it better. It’s not the type of game that I like. 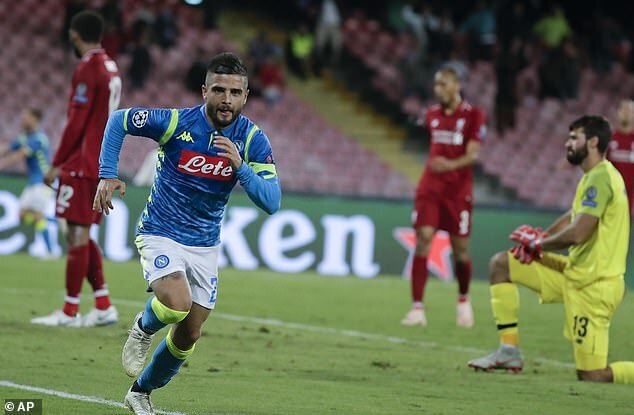 Liverpool now require one monumental effort at Anfield to get past Serie A opponents Napoli next month. It will not be the first time they have had to do it the hard way and just one defeat at Anfield – September’s EFL Cup loss to Chelsea – since January will give them confidence. ‘We know that there’s only one chance left and we all want to take it. We’re going to do everything that’s possible,’ said Van Dijk. ‘We need everyone’s help. We need all the fans, we need everyone that comes to support us that night to make it a special evening for all of us. ‘We know it’s going to be tough – Napoli are a fantastic team with great players, they have a great manager – but we need to keep believing in ourselves.